Melissa Kaiserman has a business that makes perfect cents (quite literally!) An avid believer in the cash envelope system of budgeting, she created something more durable than her paper envelopes. Her solution was not only practical, but beautiful too! In solving her own problem, Melissa quickly discovered that there were many moms out there looking for the same thing. They practically begged Melissa to create a solution for them, and after some time, she finally agreed! In case you’ve never heard of this system, it works like this: take out cash for all of your daily expenses such as food, clothing, entertainment, or fun money. Many people pay their mortgage and utilities online, but for everything else, they use cash. Separate your cash into different envelopes to represent each category. When your money is gone, you can no longer spend on entertainment, or whatever the case may be, for that month. The system is a way to stay disciplined and ensure that you stick to your budget. Listen to hear how Melissa turned a cute little cash envelope system into a thriving business that supports her family. After starting a blog soon after her third child was born, Melissa later decided to dig out the old sewing machine her mom gave her and work on some simple sewing projects. Her old sewing machine had traveled with her through college and marriage, and she finally decided to quit being afraid of it. 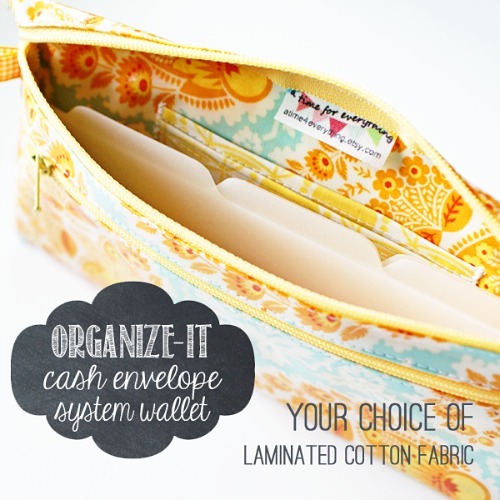 In 2010, she found a tutorial for an oilcloth wallet meant to be used with the cash envelope system. She decided to attempt the project, although it seemed a bit outside of her skill level. Her first cash envelope wallet took about 10 hours to make! Melissa shared the project on a her blog with a link to the tutorial. After being deluged with comments, emails, and real-life friends begging her to make them one, she finally gave in and took orders for about a dozen envelopes. It didn’t take long for her to feel completely burnt out making them. Those first twelve envelopes took her a really long time to make. 3 months passed, and Melissa quickly forgot how painful the first batch of envelopes had been to create (just like childbirth!). She was ready to start again. She added pages to her blog and sold a simple design. It wasn’t until she attended a craft retreat, made several wallets all at once, and had extra inventory that Melissa finally decided to try Etsy. On October 14th, 2011 (If you’re reading this on the podcast air date, today is Melissa’s 3rd Etsy-versary!) Melissa listed her first item. She had a sale within 24 hours! 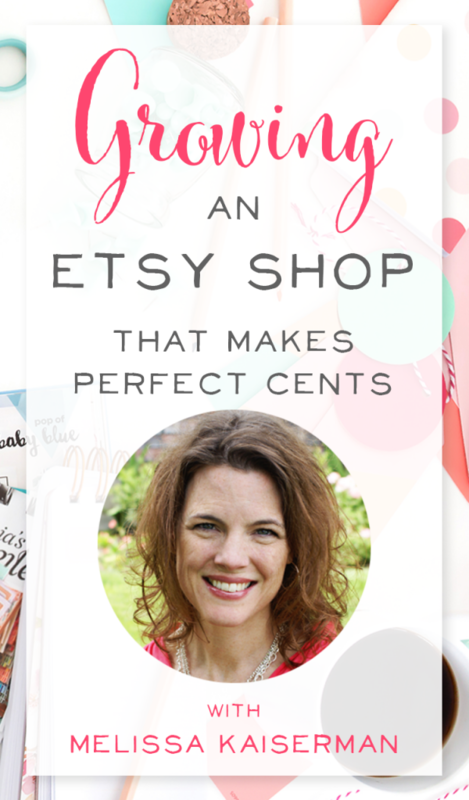 Melissa attributes 3 factors to her early success on Etsy. Low competition – Only she and one other seller (whose products looked very different) were selling handmade cash envelope systems on Etsy. The Economy – In 2011, many people were still choosing to downsize and live more frugally. The trend for cash envelope systems was still on the rise. A giveaway on ABowlfulofLemons – In January of 2012, Melissa did a giveaway here and offered free shipping on all orders during the giveaway time period. The event drove a lot of sales, and Melissa still gets Etsy traffic from that one blog post from almost 3 years ago! Melissa’s husband, Dave, had a really stressful job. They both felt that he should resign, so they began putting Melissa’s Etsy earnings into savings to build up 3-6 months of living expenses. After Dave resigned at the end of summer, 2012, he was applying to several jobs, and made it to the final round of interviews for 3 different positions for which he was well-qualified. In all 3 cases, he didn’t get the job. In the meantime, Melissa received an $1800 order for a credit union who needed door prizes. She had to close her shop for a week just to get the large order done, and she never could have finished it without her husband’s help. Finally, the lightbulb went off for both of them: they should be doing the business together. If Dave had gone back to work, Melissa would have had to scale back the business and not accept as many orders. Instead, they were working well as a team, and everyone in the family loved having their husband and dad home. 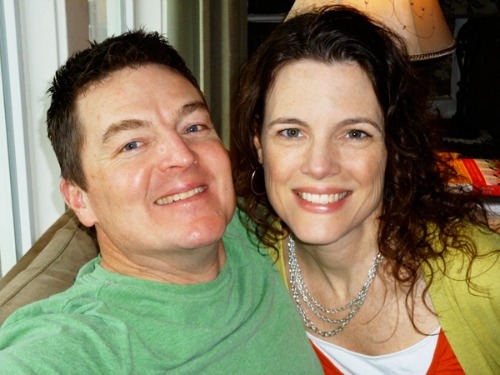 Frugal to the core, Melissa shares that she and Dave have no debt except for their mortgage. If they had more expenses, they wouldn’t be making enough from the Etsy shop to do it full-time. 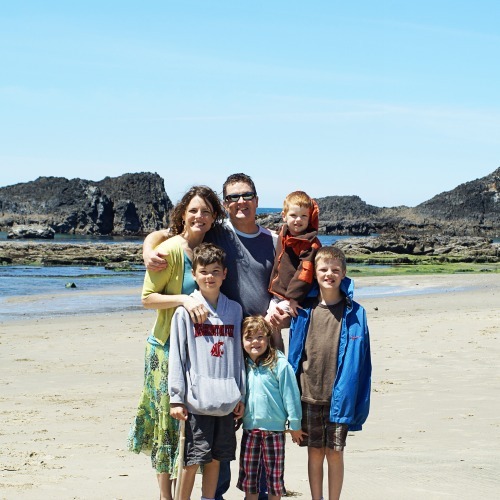 “Our lifestyle is worth it enough for us to live frugally to be able to keep doing this together,” Melissa says. Melissa keeps an $18 envelope design in her shop at all times. She’s never raised the price of that item, because she wants to have an affordable option that even the strictest of budgets could accommodate with a few months’ of fun money. Melissa had to think outside the box to find out where her ideal audience hung out. It took some experimenting too! In the beginning of her business, she assumed that most of her customers would be those who followed frugal living websites. Instead, she discovered that organizing blogs tend to have her ideal customer as followers. 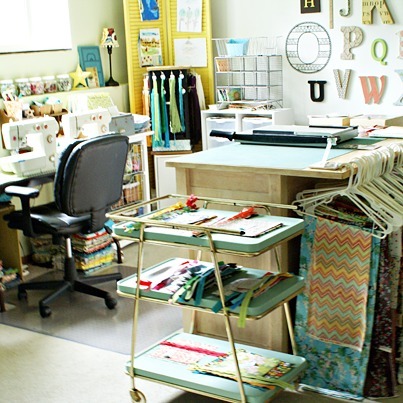 People who like to organize usually like pretty things, and they’re often moms on a budget. Hosting giveaways on organizing blogs has proven to be an excellent way for Melissa to attract her ideal customer and grow her business. She admits that the only two giveaways that didn’t have a great return were on frugal living blogs. The one exception? 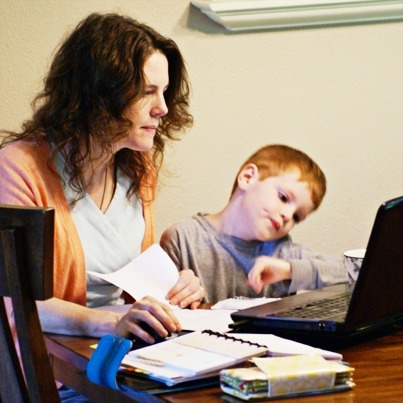 A giveaway on MoneysavingMom was her most successful ever, but this is because her readership is so large. So even though the focus is on frugal living, there is a lot of overlap with other topics as well. Melissa is someone who lives the business she’s created. She’s not just a crafter who makes wallets because she can, she’s been an avid user of her own product for years. She’s passionate about helping others to get out of debt and live on a budget. She’s earned the trust of her customers because they know she doesn’t have a secret stash of credit cards on the side. Melissa's son helping her work on the budget! In March, a potential customer just starting her Financial Peace journey wanted to place an order and asked if I would allow her to pay half up front and half when it was finished since she didn't have the full amount available right then. At the risk of losing the sale altogether, I had to say no. I explained that I am so passionate about people living debt-free and within their means that I could never in good conscience put myself in the place of a lender. I encouraged her to save up for it and that the freedom she would experience from following a budget and making those little decisions along the way to becoming debt-free would be worth it. One, standing by your convictions and doing what is right always bears fruit, even if you don't see it right away (or ever, as is sometimes the case). Two, there really is great freedom and joy in choosing to delay gratification and avoid debt. It's like giving yourself two presents! Melissa took the 5 best How-to posts on the topic, compared them all side-by-side, and went through the process systematically, step-by-step. She then developed her site on a test URL so she could do things one at a time, and no one saw your site as she was working. Finally, she pointed servers to her domain, put her site in maintenance mode, and then took 24 hours or less to make sure everything was working fine before going public. Gretchen also has a 31 day series on becoming savvy with WordPress! Etsy 360 – provides a shop link in the navigation menu that brings up a visual form of your Etsy shop on your own website, while payment transactions still occur on Etsy itself. Woo Commerce – This free plugin allows you to create your own shop right on your WordPress site. You’ll pay normal paypal fees or fees for shipping program, but the Woo Commerce plugin will match the look and feel of your blog’s child theme to create a great fit. Melissa says installing Woo Commerce was easy, but it’s a lot more work to list each product compared to Etsy. Ever since she began selling her own products, keeping up with her blog became difficult to manage. Melissa misses that connection with her readers, so she’s starting her new website with a new focus. Lucky for us, she’s kicking off her blog’s new focus with 31 Days to Managing Your Time Talent, and Treasure. Her blog’s new tagline is Managing Time, Talent, and Treasure for His Glory. How did she come up with this? She asked her readers to figure out what they wanted to see most! She linked to the form in her email newsletter and on Facebook. She received about 100 responses, which was not as many as she had hoped for. Melissa chose not to offer an incentive or giveaway, but she’s encouraged that those who did take the time to complete the survey are her ideal readers – the most committed and interested. Focus on the titles of each product. Put relevant information at the very beginning of the product listing. Ex. Cash Envelope System versus Cute Blue Wallet. Use words people actually search for when they’re ready to buy, and use Etsy’s search bar for related suggestions. We’ve got more info on Etsy SEO and finding the right Keywords right here! Participate in Black Friday, Cyber Monday, or other sales with relevant tags to attract more customers. Set a firm shipping deadline. Make it clear in your shop announcement that all orders must be placed by X date in order to be shipped on Y date. Melissa recommends never saying “in order to guarantee arrival by Christmas” because in all honesty, the package is out of your hands once you send it on its way. However, you can provide a firm guarantee of the date that you will ship the package and let your customers evaluate the probability of arrival. Be realistic in what you’re able to do. If you receive too many orders, can’t complete them, and you let people down who are depending on those gifts, those bad experiences will be reflected in your reviews. Use the Print Edit Function in Firefox. It’s right in her toolbar. Melissa goes to the sold order, hovers over a sale, clicks and it will isolate just the orders she wants to print. Melissa prints orders according to the day they’re scheduled to be shipped. She staples together all the orders for each day, cuts fabric for that shipping day, and then has a system to keep all the orders together that ship on a given day. At one point, Melissa was so overwhelmed with orders from a blog mention on IHeartOrganizing that she had to shut down her shop for a weekend. She realized that she was catering to her customers by relisting orders that had sold out and spending 2 hours a day just on convos and making listings. Stay in Touch with Melissa! MakerySpace.com, where Melissa educates, equips, and encourages fellow Etsy sellers and other makers.